Cruises that include ports in the Middle East provide an exotic and memorable experience. The Middle East includes some of the world’s most intriguing ancient treasures and modern wonders as well. 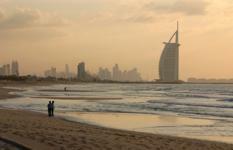 Dubai, one of the seven United Arab Emirates, is a sleek and quickly developing city on the Persian Gulf. Its spectacular skyscrapers provide a backdrop for sparkling beaches. Venture on shore and you’ll find terrific shopping, from traditional spice markets to huge malls. If you golf, play a round on one of Dubai’s very fine courses. Or, take a desert safari: an exciting ride up and over sand dunes, with lunch at a desert oasis. The impressive skyline of Abu Dhabi, another Emirate, earned it the nickname "Manhattan of the Middle East.” Like Dubai, Abu Dhabi has fabulous twenty-first century buildings. The Sheik Zayed Grand Mosque, opened in 2007, uses building materials and furnishings from around the world, including gorgeous gold-plated chandeliers, and is large enough to hold 40,000 worshippers. After a tour of other highlights of the city, high tea at the Emirates Palace Hotel is a treat. On the Red Sea, Cairo, Egypt, has a bustling population of 16 million people. The "Arab Spring” of 2011 began in Cairo’s Tahrir Square, and the energy of that revolution still infuses the city. Cairo has the world-class Egyptian Museum of Antiquities, beautiful mosques and the imposing fortress of the Citadel. Many cruise passengers take an excursion from Cairo to the ancient pyramids, or choose a day cruise of the Nile River. When cruising the Middle East, be aware of regional customs. In Muslim countries, it’s important to dress conservatively when going ashore: long-sleeved shirts and long pants (not shorts or capris) made of light cotton or linen are appropriate. Women need a head covering (a scarf will do) to visit a mosque. And, take care when you use your camera: in many places, it’s considered offensive to photograph Muslim women. Some cruises of Middle East are segments of a world cruise or a repositioning cruise. However, there are all-Middle Eastern cruise itineraries, too – talk with your Cruise Holidays personal cruise expert about your options for exploring this exotic part of the world. More days at sea or in port - which is right for you?